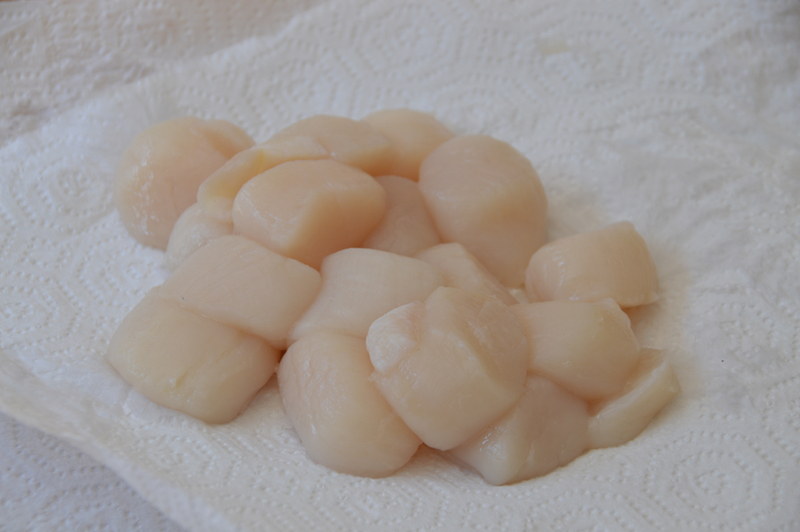 I've never been one to go out and buy scallops for a dinner, mostly because they're known to be more on the expensive side, and when you order them at a restaurant, the serving is usually quite small. 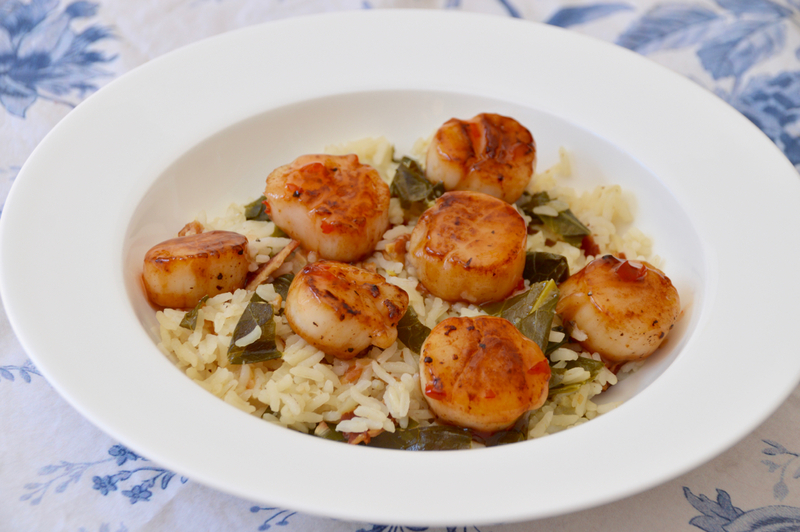 However there is one small exception in this matter, and that is a now-closed restaurant I used to go to in Greer, South Carolina called the Bin 112, which served up a dish called Candy of the Sea, that was scallops seared and glazed in sweet chili sauce, served with Carolina rice and slow cooked collards. Holy moly, that dish stuck with me, along with many other recipes from there, but that one, I crave. They closed down in 2018, so now I am personally tasked to recreate all of my favorite dishes from the Bin just so I can satisfy these crazy cravings. So bring on the collards! My parents live in South Carolina and for as long as I can remember, I have been a die-hard fan of all things southern - BBQ, hush puppies, okra, tomato pie, mac and cheese, and of course, collards. Traditionally, collards are slow cooked for hours then garnished at the end with vinegar, usually served up with something like beans, cornbread and a pork chop. Sounds wonderful right? It is, except these days not many people have hours to kill waiting for collards to cook. 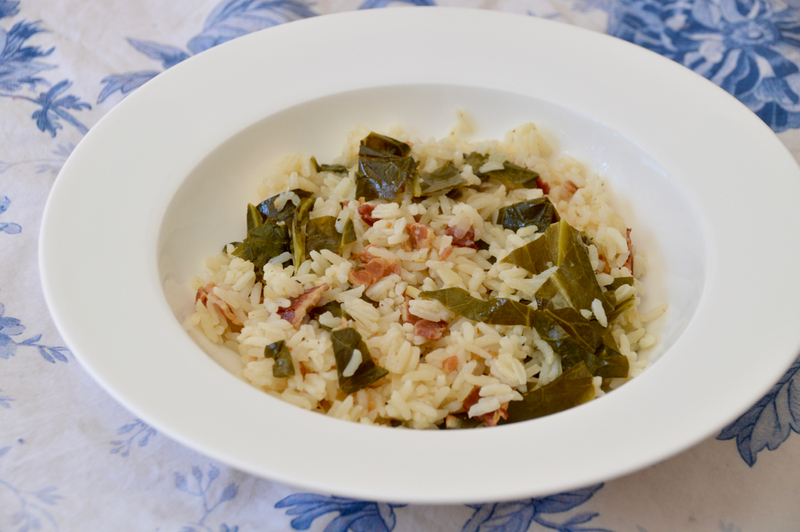 In this recipe, I sauté garlic and onion, then add in the coarsely chopped collards, crumbled bacon, broth, salt and pepper, and let that slowly simmer for about 30 minutes. 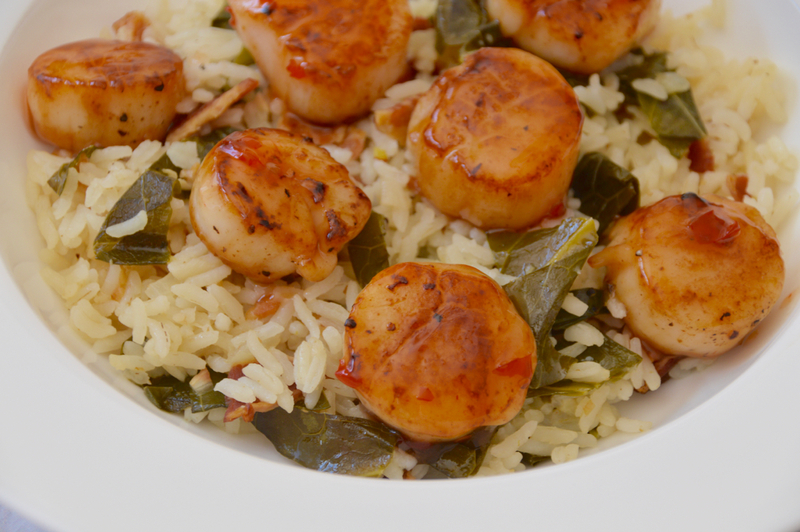 Then I take a strainer and separate the juice from the collards, and mix it all together with Carolina rice, to create a pillowy bed for these sweet and savory scallops. 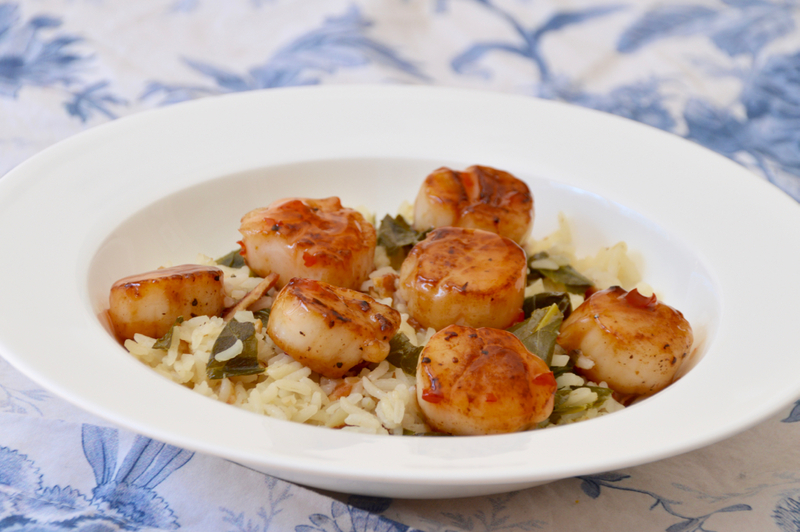 Once the rice is done, it's time to pan sear the scallops, which takes less than 10 minutes...but there is a trick. When searing scallops, or anything for that matter, the #1 rule is to not touch it until it's time to flip it. Seriously, don't move it around in the pan or pick it up to check the sear situation, just leave it. 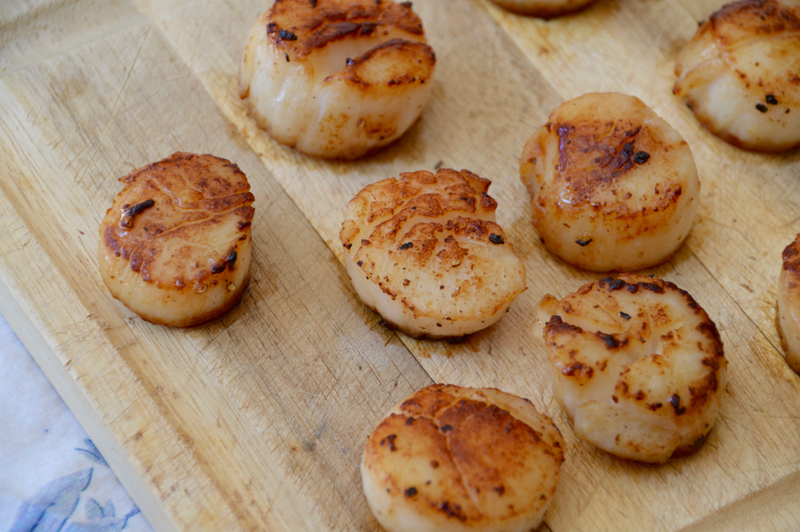 First, you'll want to pat each scallop dry with a paper towel, then lightly season them with salt and pepper. Heat a pan over medium-high and melt 1-2 tablespoons of butter into the pan. Once the butter melts, turn the heat down to medium. The general rule of thumb is 2-3 minutes per side, and they'll be done when they turn white and feel firm. It may not be exactly the Bin 112 dish that I miss, but the salty and slightly bitter taste of the collards and bacon paired with the juicy, sweet scallops certainly do the trick! 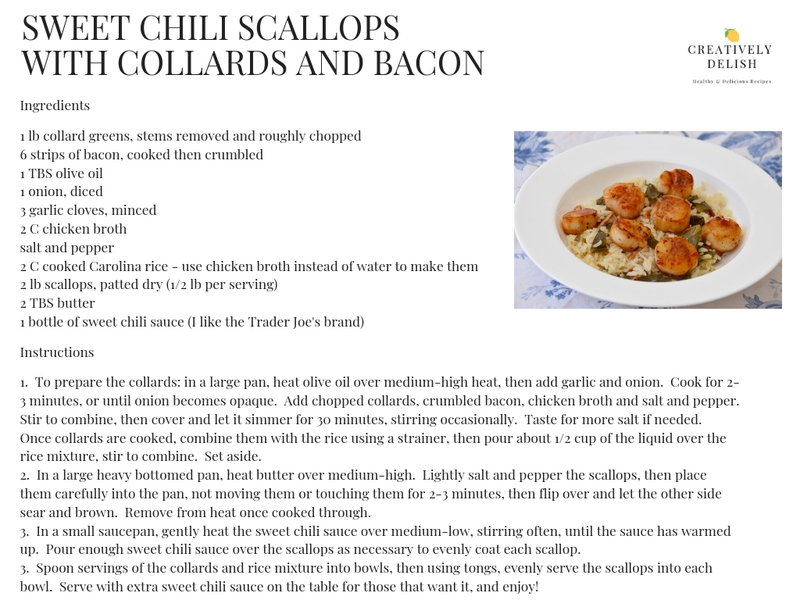 You can check out the recipe below or click here to print! 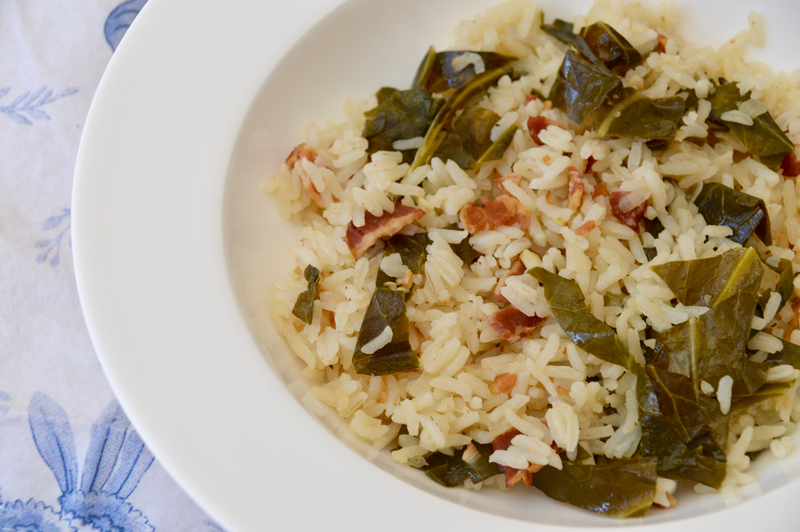 This recipe is intended to serve four people, probably with some leftover rice and collards. Enjoy!